i’m a fixer. it’s what i do. in fact, it’s probably what gets me in the most trouble with nicole. i see a problem and i want to fix it. the quicker i can fix it, the better. in some ways, being a fixer can be a great thing. 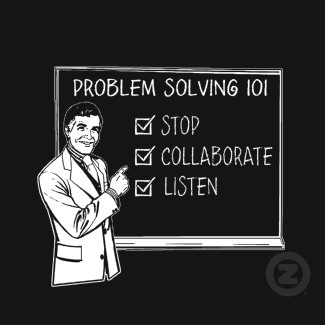 fixers are problem solvers. fixers are able to cut through the layers to identify the root of an issue and then offer a solution. they’re perceptive and discerning. more often than not, fixers will go out of their way to, well, fix things. and that’s where many of us get in trouble. fixers have a hard time switching gears and turning things off. a few years ago nicole and i were invited over to one of my coworkers’ house for dinner. throughout the night i would bring up stuff about work without even thinking about it. that’s how the mind of a fixer works. after what was probably the sixth or seventh time i mentioned work issues, he looked at me and said, “dude, you’ve got to find an off switch.” we laughed it off and i made a conscious effort to keep my work thoughts inside my head for the rest of the night. if i didn’t have an off switch, i could at least give myself a mute button. in the months after that dinner, whenever i was “off the clock” and and had a thought about work, i’d remember what he said about the off switch. right after i remembered it, i’d say some excuse and then go back to solving the world’s problems. he said i needed an off switch. that didn’t mean i had one. about 15 months ago i wrote a post that was inspired by a tweet i’d read that said, “taking a day off is written right next to don’t kill anybody.” in it i wrote a lot of really nice ideas about taking time off, protecting yourself, and doing whatever it takes to clear your head from the stress and busyness of work. all of those sound pretty in theory. i wonder where my life would’ve gone had i actually taken my own advice. i knew what to do but, at the end of the day, i was still a fixer. one of the worst things for me was work e-mail. i have a laptop, tablet, and phone that all have access to my work e-mail. whenever i’d open one of them and see a new notification, i’d immediately have to look at it. and, of course, i’d feel like i had to accomplish whatever the task in the e-mail was right away. that happened over and over and over. it led to my mind being distant while i was supposed to be paying attention to my wife. it led to me working after she went to bed because things needed to be done. ultimately, it led to burnout, crisis, and unhappiness. the tipping point for me happened one day in a staff meeting. in an off the cuff comment, my pastor said he wanted to remind us that if we got a work e-mail after hours, we didn’t have to respond to it until the next day. he didn’t expect us to work in the off hours. he didn’t expect us to be on call 24/7. he didn’t expect us to fix it right then and there. to me, that was permission to do the one thing i knew would fix my problem of fixing everything: taking my work e-mail off of my phone. that was the off switch i needed. our society glorifies work-a-holics as a special breed of people who we should all be like. the reality is the work-a-holic’s entire identity is wrapped up in their job. when they really stop for more than two seconds, they realize their job isn’t nearly as fulfilling as they think it is. there’s nothing noble about working all of the time. it’s actually irresponsible. our minds, bodies, and souls were meant to rest. the bible mentions resting hundreds of times. even jesus, the guy who was fully human and fully god, had to take time off to recover and rest. there’s a reason i’m posting this on a friday: i want you to rest this weekend. i want you to take your e-mail off of your phone and forget about work for a couple days. i want you to mow your yard, play disc golf, or walk around downtown like you’re 17 again. maybe you can throw a hammock between two trees and take a nap or read a book. whatever you do, don’t work. monday’s problems can be scheduled for monday. you deserve this weekend. i want to change the world. it’s one of my big giant dreams in life. to do that, i’m going to need your help. you can’t help me if you’re exhausted, burnt out, and miserable. take this weekend and rest up. we start on monday. I don’t want to be famous. I want to make an impact.